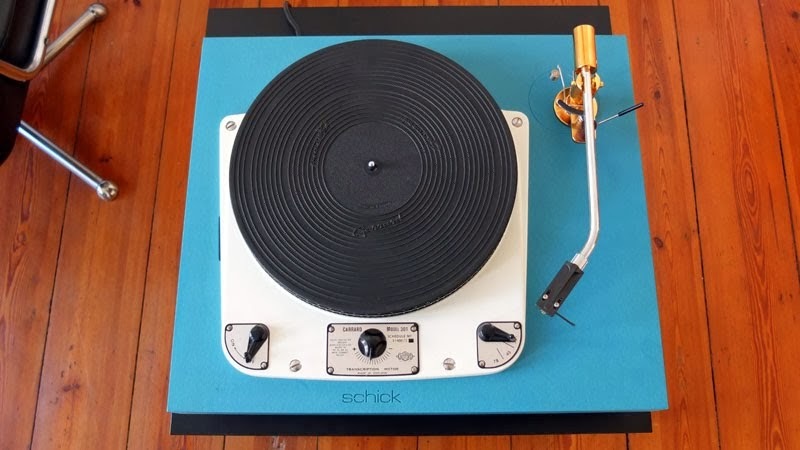 I bought a Garrard 301 on Ebay in pretty bad shape, but cheap enough to dare it anyway. I suppose you know about this record player. In case you don’t just Google for it or look at ‘Vinylengines’ dedicated Garrard Forum. Let’s sum up the condition on arrival: The speed and Power switches were broken. The platter was oxidated. The main bearing worked silent, just as the motor.I decided to disassemble the unit completly, in order to have the metal parts glass-blasted. This way it is possible to get rid of the oxidated coat. Remember to seal the bearing shaft and the inside of the platter with cardboard and tape. The suffering platter, and in greater detail. Glass blast was also taken as an option for all the switching rig. A manual cleaning did not show the desired result. Also the coating contains Cadmium, blasting it away would be a good idea. It is the yellowish stuf on all the levers. Of course this procedure gets rid of all kind of grease and dirt collected over the years. The blasted parts, like new, just brush the remaining blast particles away. After painting the platter new I manually filed the strobe marks back to shininess. Took about 90 mins. What about the ground plate? I decided not to remove the original emanel paint. It was polished, but the result showed still some little marks and the color seemed old. It became yellowish. So I spray painted it with a cream white car color close to the original. The picture shows the ‘before’. I assembled everything on a MDF board. it is not supposed to be the final plinth, it is a mere test rig. The fine adjustment of the assembly takes some time untill everything works as it should. Especially the correct running of the eddy current brake needs some extra adjustments. After tests in various wood and stone plinth materials, I finally found one that actually sounds good in all aspects of sound.